A new simulation facility at the Planetary Spectroscopy Laboratory of the German Aerospace Center (Deutsches Zentrum für Luft- und Raumfahrt; DLR) could help revolutionise our understanding of the hot, hidden surface of Venus. The Planetary Spectroscopy Laboratory (PSL) can analyse rock samples similar to those found on the surface of Venus at temperatures up to 1000 degrees Celsius, enabling researchers to interpret accurately data acquired by space missions and ground-based observations. Although Venus is a similar size to Earth and sometimes called its twin planet, it is surrounded by a thick atmosphere of mainly carbon dioxide and clouds of sulphuric acid that make it very difficult to study the planet’s surface. Until recently, it was thought that a lander was needed to analyse the chemical composition of rocks on the ground. Because different chemical compounds emit radiation at specific electromagnetic wavelengths, every mineral has a unique ‘spectral fingerprint’ of emission lines. To interpret remote detections of these spectral fingerprints and determine which rocks are present, planetary scientists need reference catalogues showing emission lines acquired under conditions matching those on the surfaces being studied. For more than 40 years, scientists have attempted to take measurements under Venusian conditions to build up these libraries but, until now, with very little success. The PSL, funded through the Europlanet 2020 Research Infrastructure, is located in a temperature-controlled room in the Institute for Planetary Research in Berlin. 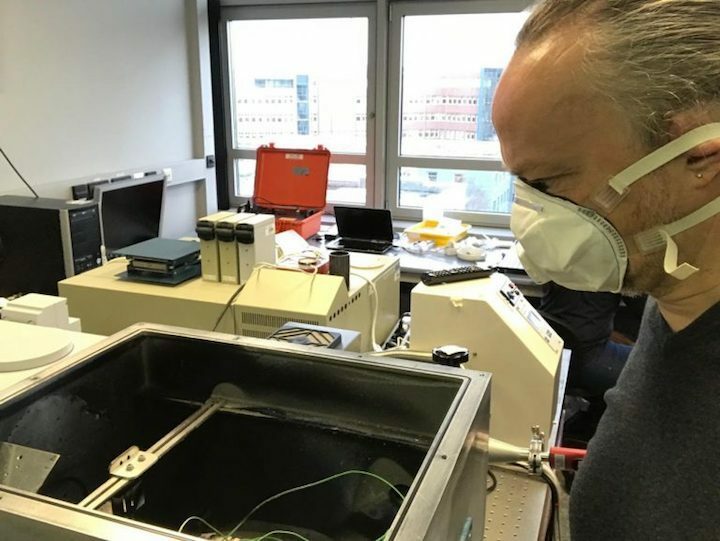 The new Venus chamber uses state-of-the art detectors and electronics, and innovative ceramic enclosures to block out background radiation that can drown out the spectral signals from samples at high temperatures. Earth analogues for rocks on Venus include volcanic rocks, such as basalt from Spain and rhyolite from Italy, rocks that have undergone intense heating, such as granite from Norway, and iron-rich rocks such as haematite and magnetite. The new facility has been used to analyse spectroscopic emissions by analogue rocks across the range of temperatures found on Venus, which average 462 degrees Celsius, and at all known atmospheric windows of Venus. Observations in six spectral windows using Venus Express’s Venus Monitoring Camera (VMC) and Visible and Infrared Thermal Imaging Spectrometer (VIRTIS) instruments have revealed chemical variations that can be related to geological features on the surface of Venus. The measurements from PSL are now being used to validate and improve understanding of these Venus Express observations. 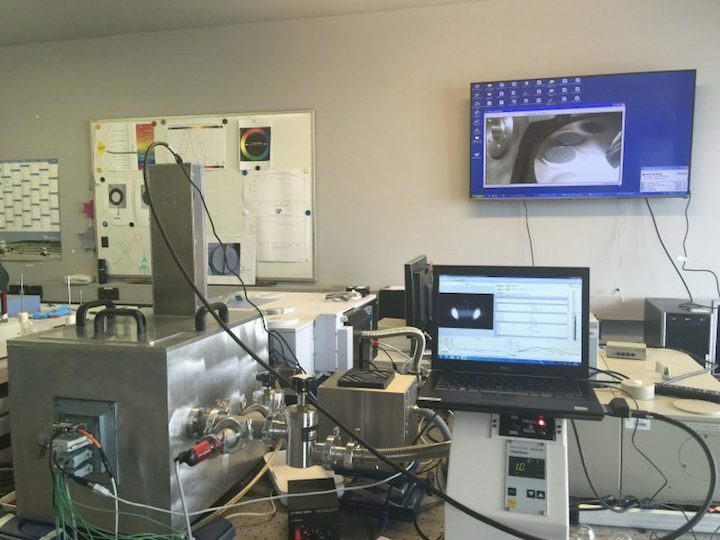 A call for applications is now open for researchers to obtain up to a week’s free access to the PSL and other Europlanet laboratory and field facilities, funded by the European Commission European Union’s Horizon 2020 research and innovation programme under grant agreement No 654208. The closing date for applications is 1st March 2018. Quelle: This project has received funding from the European Union's Horizon 2020 research and innovation programme under grant agreement No 654208.